Animal Defenders International : Publications : Bolivian Circus Rescue: Preparing the animals to fly! Bolivian Circus Rescue: Preparing the animals to fly! It is one of the most complex and challenging rescue operations that we have undertaken and it follows one of our most successful campaigns – the ban on animal circuses in Bolivia. The past months have seen intense activity in the UK, USA and Bolivia to ensure that the animals will soon be starting new lives, free from the circus. It is vital that we show that the Bolivian ban can be effectively implemented, and we must save as many animals as we can from the terrible suffering we have exposed in South American circuses. We have built facilties to hold the animals both temporary in Bolivia, and permanent homes in California; we have addressed regulatory and veterinary issues; and we are finalising preparations to fly these lucky animals to freedom. This incredible operation has been made possible by the generosity of former US TV presenter Bob Barker – we are extremely grateful. We are committed, as always, to caring for these animals for the rest of their lives. We also need to prepare for other circuses closing as the ban is implemented. We must show that we can secure bans on animal circuses and save the animals – wherever they are in the world. So we need your support as well. The animals were handed over to us in the circus beastwagon in which they had always lived. When dealing with animals like lions and baboons we have to ensure public safety. We hired security to protect people and the animals – unbelieveably, some people turned up to throw stones at them! ADI vet, Mel Richardson, flew to Bolivia to assess the animals and give the vaccinations required for their life-changing journey. They are monitored regularly by local vets in consultation with Mel. We then began the simultaneous tasks of constructing a quarantine pen, organising transport, securing homes for the lions and baboon and commencing construction on those. We constructed a quarantine facility and the animals were safely moved into this. Only Tilin the baboon took his time walking into the crate that was used to transfer him; the lions strode straight down the ramp and into the new facility. The facility is smaller than we had proposed, but nevertheless it is an improvement on their beastwagon, it is safe and secure and we are counting down to their move to real freedom. Tilin will be coming to the UK and we are constructing a quarantine pen and enclosure for him at the Lakeview primate sanctuary – also home to the rescued lab monkeys (see p3). ADI will fund Tilin’s care for life. 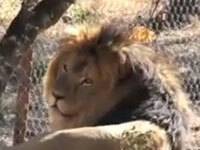 The lions will be going to the Performing Animal Welfare Society (PAWS) Ark2000 Sanctuary in California. Although world renowned for their care of elephants, PAWS also have a large number of big cats and other animals. ADI has campaigned alongside PAWS and we are delighted to be in partnership with them to save these lions. ADI is funding the construction of a state of the art habitat for the lions with sleeping quarters, feeding areas and a huge natural enclosure set on a hillside to give them views across the valley. ADI will be funding the care for these animals – feeding, veterinary, staffing – for the rest of their lives which we all hope will be many years. As PAWS founders Pat Derby and Ed Stewart said to the recent Summit for Elephants, “ADI don’t just ask for help and then walk away, they absolutely step up.” In turn we are proud top be to working with PAWS. We are gearing up to the move and look forward to reporting in the next issue the sight of these mighty animals striding out in the Californian countryside. This is a complex and expensive rescue but it is a very important one. This is where we show that circuses can be banned and the animals saved. Again, we cannot overstate our gratitude to Bob Barker for making this operation possible. However, we urgently need your support to ensure that we can care for these animals for as long as they live. We also need to be ready to help other animals as we close down circuses. For the individual animals this is a wonderful rescue and a new chance at life. But this is also a step towards eradicating a vile and cruel industry. Adopt Tilin the baboon and the Bolivian lions. Our adoption scheme is vital for raising funds for the ongoing care of our animals.